Happy Birthday Vaseline, you look amazing! I guess you've been your own best secret to aging so well. You have been a staple in my life forever. If I recall, you were my first beauty product. I was a complicated birth and while my mother was still in the hospital, I came home from the hospital than her but with some severely dry skin. My grandmother would slather Vaseline on every inch of my body. I looked like a cooked bird. As I grew up, Vaseline became part of my grooming ritual. Each day I would shower, lotion, Vaseline. I guess the guys on Jersey Shore would call it SLV. It is still part of my regime as a grown up. My feet are always always covered in Vaseline, if not my heels would feel like sandpaper. Let's not forget elbows and knees. Here is an excellent trick for folks who want to seal in their favorite fragrance. Layer your fragrance and seal it in with Vaseline. Best trick ever. Whether young or old, poor or rich we know that everyone has a Vaseline beauty trick. In honor of Vaseline Petroleum Jelly's birthday, they are asking fans to help celebrate. 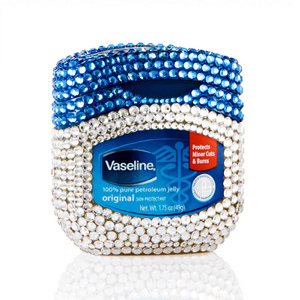 Head over to Vaseline's Facebook page and enter at a chance to win the bedazzled Vaseline shown above. Lucky contestants also have a chance at winning a $500 gift card so you can buy all the Vaseline you will ever need. Hurry up and help them celebrate!